SIGN UP USING THE FORM OR CALL 417-325-4136. The Canary species is called Serinus canaria and is actually a member of the finch family, native to the Canary Islands. The wild canary is greenish yellow over most of their body with yellow underparts. 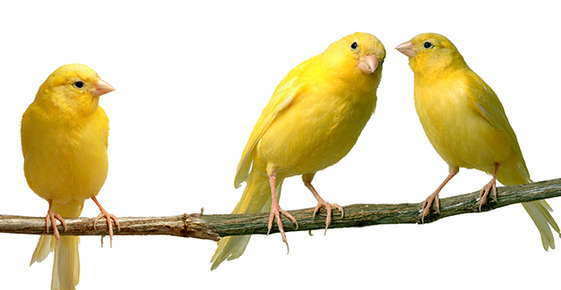 The domestic canary comes in an array of bright colors and can live up to 10 years. Male canaries sing better than females, although the canary may not sing as much during a molt. The canary does not require a great deal of attention and are suitable for beginning pet bird owners. Canaries are not social birds so a single pet canary will be happy. Get the largest cage possible, that allows for room for flight (a pet canary should never have his or her wings clipped and should be able to fly in the cage for exercise). "Flight" type cages are the best (home built or commercial) since they are designed to provide room to move. Remember that a long cage is better than a tall narrow one (the height is not all that important). Try to get a cage at least 24 inches long. Watch the spacing between bars - no more than 1/2 inch. Wire cages are best, wood or bamboo cages are too difficult to keep clean. Wood perches of varied diameter work best (3/8 to 3/4 inches). Some canary keepers alter smooth round perches by scraping them with a saw blade or utility knife, just enough make the surface slightly irregular (easier to grip and the variety may make the perches more comfortable for the canary's feet). Do not use sandpaper perch covers. Canaries are pretty hardy and can be kept at room temperature. Keep the cage away from draft, air conditioners and windows that receive direct sunlight (the cage and canary can get overheated). Cover the cage at night, at the time the sun goes down (unless you live in an area with extremely long nights or days such as the far north). Canaries need their rest and will do best if given a light/dark cycle that approximates natural changes. Keeping them up late with artificial light is not healthy for them. Provide toys, but place them in the cage in such a way as they do not obstruct flight space. Your canary might enjoy swings, mirrors, bells, and hanging wooden or acrylic toys. Fresh water should be available at all times. A shallow dish of water or a special bath bought at the pet store should be provided at least 3-4 times a week for bathing. A good quality seed mixture suitable for canaries can be the mainstay of their diet. Pelleted diets suitable for a canary can be offered as well - these are not as palatable as seeds but many owners keep a dish of pellets in the cage along with a dish of seeds. Fresh foods and greens should also be offered. Good choices include apples, oranges, bananas, green peppers, canned corn, fresh corn on the cob, cooked broccoli, raw spinach, raw dandelions, raw collard greens, raw Swiss chard, pears, peaches, strawberries, cucumbers, squash, etc. Bits of hard boiled egg can also be offered occasionally. Sprouted seeds are an excellent treat for your canary. As seeds are eaten the hulls may be left in the dish, so at a quick glance the seed dish may look full when in fact it is just hulls. Blow the hulls off the seed dish at least daily and replenish the seeds as necessary.